Indulge in the heavenly scent of violets and roses, combined with top notes of lemon and balanced with a musky base to create a fragrance that is both subtle and nostalgic. 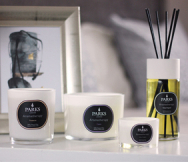 This sensational candle makes an exciting and exclusive gift for someone who deserves to relax and be pampered. Comforting rose—an old familiar friend and a notoriously romantic fragrance—is the perfect aid to unwinding at the end of a long, stressful day. Light this candle, sit back, and switch off as the captivating aroma helps you to rediscover the best version of yourself. The wonderful fragrance evokes positive thoughts, promotes spiritual relaxation, repairs your self-esteem, boosts your confidence, and fills your evening with happiness and hope as you drift away in a haven of tranquillity. The addition of highly-prized and well-loved violet, with its many excellent properties, delivers the perfect combination for this sophisticated scent. Known to relax, soothe, and inspire, this tiny perennial plant with its familiar ornamental flowers has a sweet, unmistakable fragrance. Native to Europe and Asia, it is grown worldwide and the extract from its leaves is used in many high-end cosmetic and perfume products. Brightening lemon adds a fresh note to the blend and helps to invigorate, re-energise, and improve your mood. Citrus scents are well-known for their ability to quell depression, relieve anxiety, and lift the spirit. This lovely addition balances the floral notes and perfectly completes the blend to create a scent that is harmonious, spirited, and tenacious. This exquisite fragrance is captured in the purest natural wax and poured into a beautifully-designed keepsake pot. Immaculately packaged in one of our branded luxury boxes, this is the perfect gift for a discerning recipient.